It’s that thankful time of year and since I am the wisest cat in The Tribe of Five, and the Alpha, I thought I’d do this week’s fill ins. Our Purrsonal Assistant has had quite a bit on her plate lately (and none of it was tuna) so please forgive her for getting my post up late. The Tribe (and our Humans) wish you all a very happy Thanksgiving. I can’t wait to have leftovers of any kind of people food on Thanksgiving because I am a feline who loves to eat (I’ve been known to lick the butter when The Female Human leaves it unattended). This is me, waiting patiently at the kitchen counter waiting for The Female Human to do the right thing (as in feed me). 2. I am thankful for my girth because when The Male Human finds a cat Halloween outfit for $1.00 everyone knows it will never fit me. Alberto suffers the humiliation of donning the $1.00 sushi costume find while Oliver points out how ridiculous he looks. .3. When it comes to pie, I’m not interested unless there is stinky fish involved. Pie? I’m not sure what that is but if tuna is involved, count me in! 4. A feast is not a feast without someone to cuddle with after dinner. Oliver and I love to eat and we also love to snuggle after a good meal. 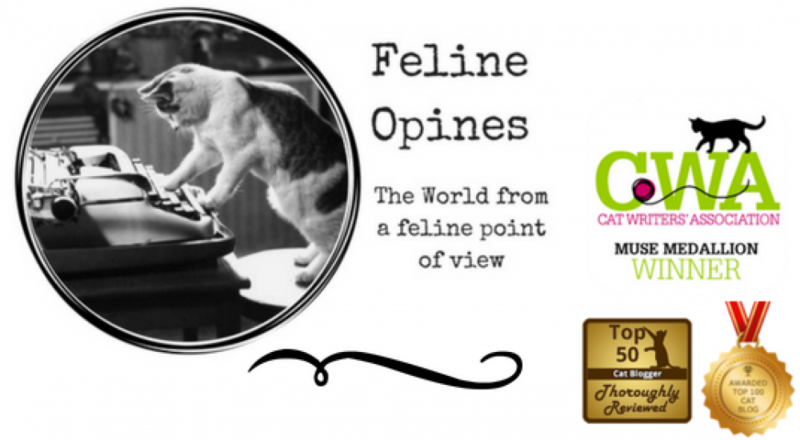 This entry was posted in cats and tagged cats and thanksgiving, cats and tuna., thanksgiving by Feline Opines. Bookmark the permalink. Great answers, i hope you don’t snag enough on Thanksgiving to make yourself sick. We sure liked your answers and cuddling works for me too! Kitties do the very best with Friendly Fill-ins. I love the cuddling part. I hope you get some “accidental” turkey for Thanksgiving. Turkey and snuggling are the best! Buddy would totally agree with you about the fish and the costumes. I hope your assistant makes a fish pie for you (but don’t count on it). Hah, our assistant is a lousy baker so there are no pies in my future ! Thank you for joining in on the Friendly Fill-Ins, Tucker! Your answer to #2 had me laughing. Around here, Toby is the same way, as his girth means that most costumes won’t fit him. He’s fine with that. Wishing you lots of Thanksgiving leftovers! You are indeed a very wise cat. And totally adorable. Why thank you! The Female Human says my crossed eyes add to my charm. That may be true but they really mess with my depth perception!